Is there really exist the perspective poker playing cards? Here we will introduce you the working principles and types of the perspective poker playing cards. Perspective poker playing cards do not have any difference with original cards on appearance, even the feeling and the quality are same as the original cards. How does perspective cards work? 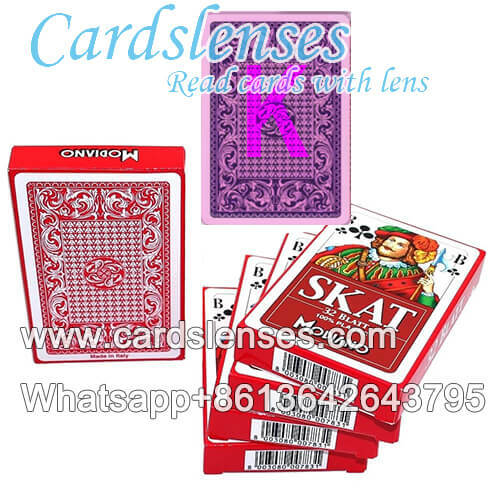 In fact, the principle is very simple, perspective poker playing cards are made of normal playing cards, the perspective playing cards are printed with the special optical invisible ink marks on the back, these marks can not be seen by naked eyes, only through the perspective contact lenses or glasses. There are a lot of perspective poker playing cards, the common perspective playing cards brand such as Modiano, Copag, Fournier, Bee and so on. Modiano are welcome by many casinos because their professional quality. Modiano Skat 100% plastic playing cards are special decks for game of Skat, also can be marked as perspective playing cards. Skat is a very popular cards game in US and Germany.